I love sitting down during the last couple weeks of the year to reflect on all the amazingness that has manifested. In 2016, I started keeping a list on the wall in my studio so I could write down every time something super awesome happened. It’s a great practice and has really upped my vibration, I highly recommend trying it! 2. This Minted win for their new line of wall murals! This was crazy, and by no doing of my own! A lovely friend of a friend had an extra VIP pass that her man totally wasn’t interested in, so I got to ride along! You see that floating look in my eye? Yeah, I couldn’t even make eye contact, let alone have a coherent conversation. But I painted him and Nazanin a little painting and he thought it was awesome, so that was cool. If this ever happens again, I’ll do my best to complete a sentence -_-. Also, the show was effing amazing. 5. The La Cantera Gallery opened, and has been selling my work like hotcakes and getting it into other prestigious locales, such as Kuper & Sotheby’s International Luxury Real Estate at the Dominion in San Antonio! I’m so grateful to be a part of something so beautiful! 6. Formation and Ariella. This one’s pretty important to me. Ariella found my work online and wanted to fill her beautiful fitness studio Formation with it – a community of women supporting women and creating more positive beauty in the world – and I was all about it. To top it off, Ariella is this amazing woman whom I now joyfully call my friend, and I’m so grateful she found me! 8. Epic Exchanges Podcast. 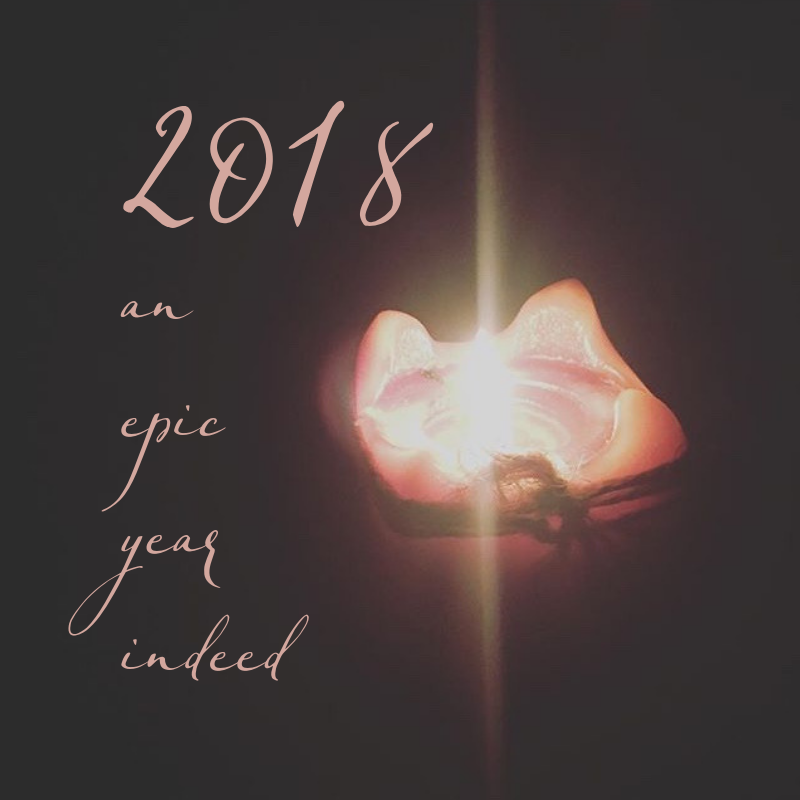 I’m so grateful to have been invited to the Power of Story / Epic Exchanges Podcast this year, and then invited back a second time! It was a wonderful experience, and so fun! Have a listen below if you haven’t yet! 10. Mastermind Retreat. Last year these amazing women and I found each other at an entrepreneur event in San Diego, and now I can’t imagine life without them! There are 3 missing from this pic, but most of us were able to come together this fall in BC and it was SO incredible. It’s so exciting when like minds converge with purpose and mission – worlds change! 11. A month in Hawaii with Bella. My precious lil niece got a new baby brother this year, so the bro flew me out to keep Bella entertained while mom took care of herself and the new babe! We went to the beach, tried to find turtles, watched lots of birds, and snuggled so hard. I’m so so grateful that I live the kind of life that allows me to have a month-long slumber party with my favorite little darling. My heart is bursting! 12. Abraham Hicks, the most impactful item on this list. The last couple of years have been a super deep dive into my Self, and the second half of this year has been especially intense in that regard. Once I came upon the work of Abraham via Esther Hicks, things accelerated in every way. I’m not going to go into detail about their work here, I will let you do that investigation yourself if you’re interested. If you’re into meditation, manifestation and the Law of Attraction, you’ll likely be pretty pumped about it. This was a year of women stepping into themselves, stepping into their power, myself included. It’s a new dawn, it’s a new day…and I’m feelin’ GOOD. 13. And just for fun, don’t forget about this adorable little old man I saw in Barnes & Noble. You believe in quality over quantity. You prefer the silence of the forest to the noise of the city. You’d rather be traveling than shopping. Your purchases and choices are a reflection of you, and you want to create a home & wardrobe that’s a reflection of who you are.